UD's X. Lucas Lu has been presented the Rising Star Award by the Biomedical Engineering Society. 10:09 a.m., Jan. 29, 2014--X. Lucas Lu, assistant professor of mechanical engineering at the University of Delaware, was presented with the Rising Star Award by the Biomedical Engineering Society (BMES) on Jan. 8. 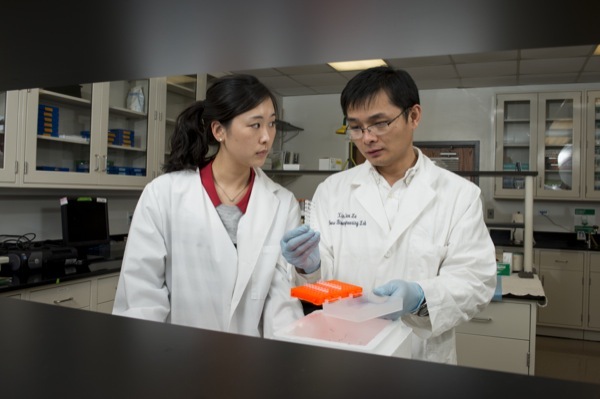 Presented during the 2014 BMES Cellular and Molecular Bioengineering Conference, Lu received the award for his lecture titled “Bisphosphonate Prevents Post-Traumatic Osteoarthritis by Promoting the Spontaneous Calcium Signaling in Chondrocytes,” in which he discussed a new drug for the prevention of osteoarthritis after joint injuries. Selection for the award is highly competitive and based on the quality of applicants’ submitted abstract and their accomplishments to date. Attendees of the conference included research scientists, professors, post-doctoral researchers and student fellows. Lu is a respected researcher in the biomedical engineering industry whose research interests include soft tissue biomechanics, joint lubrication, solid mechanics and the involvement of bone marrow in cartilage repair. His recent research has focused on post-traumatic osteoarthritis treatment and the effects of weight bearing rehabilitation after microfracture surgery. He also holds joint appointments with the Center for Biomedical Engineering Research and the Biomechanics and Movement Science Program. Lu received his bachelor’s degree in mechanical engineering from Tsinghua University in 1998 and his master’s and doctorate degrees from Columbia University in 2002 and 2007, respectively.